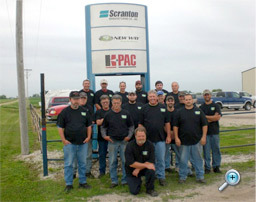 The Fabrication Department of Scranton Manufacturing is mainly responsible for their flagship company, New Way®, which has quickly grown to one of the top brands in refuse trucks. New Way® focuses on “rapid improvement” principles with their assembly lines, so these workers are not only responsible for creating the most precise parts, they must ensure they are placed properly into the production schedule. The Staging Department is a segment of the Fabrication Department, continually supplying parts to assembly lines, which increases efficiency throughout the entire plant. All Fabrication Department members are highly competent using delicate tools to check calibrations, measurements, degrees, and configurations on machines that include CNC and hi-definition capabilities.